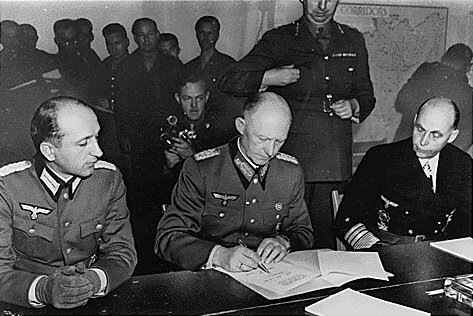 General Alfred Jodl, Chief of the Operations Staff in the German High Command, signs the document of unconditional German surrender at General Eisenhower's Headquarters in Reims, France, May 7, 1945. On Jodl's left is Admiral Von Friedeburg of the German Navy, and on his right is Major Wilhelm Oxenius of the German General Staff. 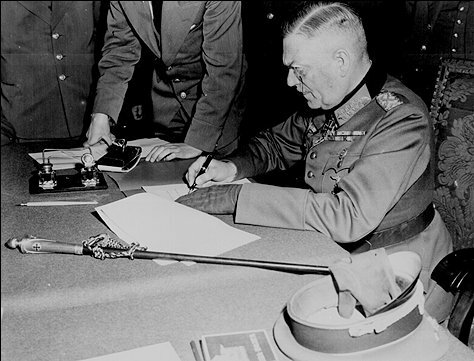 Below: German Field Marshall Wilhelm Keitel signs a surrender document at Soviet headquarters in Berlin, May 9, 1945. The Soviets had insisted that a second ceremonial signing take place in Soviet-occupied Berlin.